Phew, I’m back from the Roxy Chicken Jam and I feel really happy to be alive! The first kicker was fine though and easy for my fs3 stales, the set up was a bit tricky, box or rail to icey landing to kicker all on top of each other, you had a split second to set up it felt, not too good for confidence, but it was only 10 meters so wasn’t hard to handle. 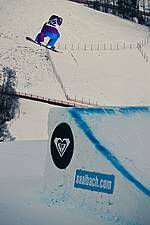 The practice day was the best, I found Anais Cettou at the bottom of the course and she had already hit the two top jumps so I followed her in for speed on both of them, then I tested the bottom kicker for her to follow in. It’s so nice to have someone to ride with when you aren’t in your element, I’m so lucky she was there. The Qualifiers day wasn’t too bad either, the atmosphere at these all girls comps is always so great, supportive and fun, it’s always good to be a part of it. There was quite a bit of waiting around for runs, we got 4 all together in the 2 hour session, I had 1 clean run in the whole lot, luckily, I was just happy to be getting some nice 3’s on the top jump and managed a few melons and bs to switch 50/50 on the bottom up down picnic table jib. UK ripper Claire Frost had an amazing final quali run including a fs7 melon off her TOES on the massive booter to bs3 on the bottom kicker, she is such a great rider she even managed this with the flu! go on Claire! The guest house me and Nils stayed in was great too, lovely, much needed sauna in the afternoons and a great breakfast in the morning, yum yum. Best part is that I got a picture on the TTR news page of the qualifiers day! STOKED!